Beautifully engraved certificate from the Edison Sault Electric Company dated 1905. This historic document was printed by American Bank Note Company and has an ornate border around it with a vignette of an angel kneeling holding a light and a train wheel. This item is over 100 years old. 40 coupons attached on top. In 1879 Thomas Edison invented the incandescent light bulb, and by 1880 the system was commercially available. The use of electricity began to inspire the world. In 1885 George Westinghouse began working on a system that would reduce electric voltage so that it would be safe to come into a business or residence by developing a device called a transformer. Now generating stations could distribute power over long distances and to various types of customers. At the same time, with the state approval to divert water from the St. Marys River, the village of Sault Ste. Marie voted to construct a canal and hydroelectric milling center. The St. Marys Falls Water Power Company was to dig the canal and construct the waterworks system. Among the founders of this company were Henry Seymour and William Chandler, two individuals who were most responsible for developing electricity as a product to be sold to Sault Ste. Marie. A land boom started in Sault Ste. Marie when people began to realize what the future might hold. The vision of mills and factories lined up along the water canal using electricity had everyone in Sault Ste. Marie believing that the town would be transformed into a major city in just a matter of years. Canal excavation was slow, however. Layers of clay, mud, and bedrock were more than the engineers had envisioned, and their money was soon exhausted. In 1887 Chandler persuaded a group of Wisconsin grain businessmen, calling themselves the LaCrosse Syndicate, to Invest in the canal project. They purchased additional property rights and began expanding the canal to a width of 100 feet. This new expansion caused another land boom. Lots which previously sold for $25 were now going for $6,000. Three railroad spurs were linking in the Sault, and a railroad bridge across the rapids was being completed. Meanwhile, William Chandier and a group of Michigan residents decided purchasing islands In the rapids would be an easier way to make use of water for power and formed the Edison Sault Light and Power Company. The Edison Company began construction In the rapids of the forebay and distribution system In 1887 and began providing direct current electricity to Sault, Michigan, In 1888. That winter, Ice conditions clogged the forebay and mechanical problems caused the plant to shut down. Undaunted, in 1891, Harris T. Dunbar and William Chandler reorganized and formed the Edison Sault Electric Company. A new power plant was built with auxiliary steam power and a larger forebay was constructed, solving the Ice flow problems. 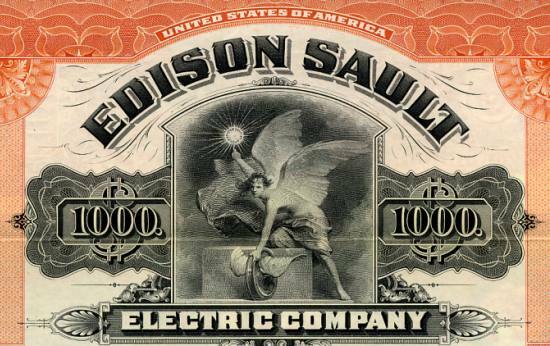 In 1892, the newly Incorporated Edison Sault Electric Company began serving Sault Ste. Marie from their new plant in the rapids. The original incorporation of the company showed capital of $57,000, with six shareholders owning 2,280 shares of common stock. The city began to prosper with an electric street car, a stable water and sewer system, gas lines, and electricity to the village homes. Street lights, elevators, freezers, and refrigeration were now available, and people were eager to take advantage of ail the new appliances that were being invented. Sault Ste. Marie became the fastest growing city In Michigan, with a population of 5,800 in 1890. However, even with the growth, the large canal project started in 1885 once again became dormant due to financial difficulty, leaving a muddy ditch for residents to contend with. In 1894 Francis H. Clergue, an attorney and business developer, came to Sault Ste. Marie at the request of Philadelphia investors to look for a suitable spot to build a hydro electric generation facility that would attract industry and develop a new population center. Clergue was encouraged by what he saw at the Canadian Sault. Their power canal project looked like it could be completed easier than the one in Sault, Michigan. He purchased the Canadian canal, completed its construction, and built a hydro electric power house supplying water and light to Sault, Ontario. After the Canadian hydro plant completion, Clergue was disappointed that industries did not locate In Sault, Ontario. He then convinced his investors to develop new Industries to take advantage of the inexpensive electrical power. The Canadian government granted Clergue's company two million acres of forest land to use for a pulp and paper factory. Red sandstone excavated from the locks and canals was used to build the world's largest pulp and paper mill What later became the Consolidated 1.ake Superior Corporation went on to produce chemicals to preserve and bleach pulp; bought two nickel mines; invented an alloy for armor plating acquired an iron ore mine, producing a thousand tons of ore a day; constructed a railroad for bringing the ore to a dock; acquired steamship lines and dry dock and went on to form the Algoma iron, Nickel, and Steel Company of Canada. As Clergue was delayed in his steel manufacturing process by the need for new furnaces, he looked at the power canal development on the Michigan side and saw the potential for mill sites and hydroelectric generation. In May of 1895 Clergue, in the name of the lake Superior Power Company, offered to buy the properties and rights to the Michigan canal from the three local banks that held the defaulted LaCrosse Syndicate bonds for a price of $68,370. In 1896 Clergue appointed Hans Von Schon as chief engineer of the new project. Von Schon had a background in designing and constructing water power plants, electric street railways, and municipal works. In May of 1893 Von Schon joined the U.S. Army Corps of Engineers. He was detailed to lake survey at Detroit, and took charge of the geological survey of the St. Marys River. Initially, plans called for six or seven power producers located on lateral canals branching out from the main trunk canal in March of 1897 test drillings revealed a large muck formation along the canal's projected path. Because of this, new plans were developed for just one canal, shorter in length. With the developments in electrical generation and transmission, no longer did Industry have to be located directly next to water power sources. This made it possible to develop one large central powerhouse to distribute the electricity. The new canal route involved less excavation and completely avoided the hazardous muck formation. Von Schon believed a drawback of this design was that the amount of water flowing from this excavation would lower the level of Lake Superior and affect shipping. It was determined that a remedial work or dyke system would have to be installed at the head of the canal. However, this gate system was still not sufficient to maintain a balanced flow out of Lake Superior. To accomplish this, a set of compensating gates would have to be submerged just above the rapids and below the international railroad bridge. In the summer of 1897, all of the elements of the design for the compensating gates, the headgates at the canal, the canal construction, and the powerhouse plans were finalized and approved. Clergue was faced with a dilemma once again. With one large powerhouse generating electricity, several customers would have to commit to using the power produced. In the eastern water power centers such as Niagara Falls, closeness to markets was an advantage. Even though the Sault plant could develop power at costs considerably below Niagara, Clergue was again discovering that the perception of geographic isolation prevented industries from responding. He was, therefore, forced to find a major power customer before he could continue. In 1896 a local company was experimenting with a new process using an electrothermic reaction to produce calcium carbide. When calcium carbide was burned, the vapor became acetylene gas which could be used to enrich natural gas, producing a brighter flame for street and home lighting. People's Gas light and Coke Company of Chicago built a small factory In Sault Ste. Marie using the hydroelectric power transmitted from a cable across the St. Marys River from the Lake Superior Power Company's plant in Ontario. The company's engineer, William Smith Horry, had just developed a new carbide furnace that revolved, continuously producing calcium carbide. This company joined with the Acetylene Heat and Light Company of Niagara Falls to become the Union Carbide Corporation. The owners of this new company were interested in the power house as a location for their operation and, most importantly, they were not concerned with the Sault's geographic isolation. Union Carbide signed on in April of 1898, providing the capital to continue the project. Several design changes in the powerhouse took place. Union Carbide insisted their electric furnaces be placed not more than 30 feet away from the generators to reduce power loss, in order to provide the space for carbide furnaces, a second story would need to be added to the structure. It was also felt that a two story structure might have a more Imposing and satisfactory appearance than just one floor, half submerged In a single story edifice. The Union Carbide contract also called for a financial reorganization of the hydroelectric project. The original Articles of incorporation had been organized under Ontario law. Reorganization was prompted by the need to have the state of Michigan authorize the diversion of water from the St. Marys River. The formation of a subsidiary American corporation called the Michigan Lake Superior Power Company (MLSPC) took place in June, 1898, with Edward Douglas as its president and Francis Clergue as its vice president and general manager. An elaborate stock and bond sale was initiated that gave the company operating capital Other terms of the contract called for taxation benefits from the city and county. In return MLSPC was to build the canal and powerhouse, producing at least 40,000 horsepower. They would also be required to construct bridge abutments for the permanent bridges which the city would later install. The original architectural design for the powerhouse called for a Norman castle appearance, but because of the requirements of Union Carbide to raise the ceiling, that architecture was changed in 1898. A local architect, D.J. Teague was hired to rework the design. The external walls were to be built of red sandstone, excavated along the canal route. Each individual unit of machinery was to be given a window, in April of 1899 a Romanesque design was selected that was both economical and would give the impression of power, importance, and stability to the building. The new design called for three large pavilions, one at either end of the structure and one in the center, thus breaking up the structure's extraordinary length. The roof would be double pitched, also helping to counter balance the length of the powerhouse. The final design for the powerhouse called for a quarter mile long building with 80 turbines, each with four runners or blades, in 80 penstocks, and a power canal lined with timber on an unprecedented scale. This design is still in effect today, as 72 turbines produce electric power from water which flows down the wooden plank-lined canal. The plant was designed to power either Horry carbide furnaces and / or pulp grinders. A certain volume and speed of water was necessary in order to produce optimum hydroelectric generation. However, the water could not exert too excessive a force or it couldn't be contained properly. The design agreed upon consisted of a canal 200 feet wide and 23 feet deep and running in length two and one half miles from the intake to the powerhouse. At its end. The canal bent northward and crossed Portage Street. At this point, a widened forebay was constructed. In the canal, water traveled from six to seven feet per second. The bend would slow the water down in preparation for its entrance into the turbines. It was necessary for the water to flow at one to two feet per second when it reached the powerhouse. If it had traveled any faster, the vibrations and wear on the turbine chambers would be destructive. The walls of the forebay, much like the canal, were to be lined with unfinished logs. Since no erosion was expected on the bottom of the forebay, it was to be left unfinished. Because the canal was to only be 200 feet wide, a number of precautions had to be designed into it. The power canal was to be divided into sections: the intake (section one) was rock, (section two) was sand, (section three) the forebay to the powerhouse was clay. The canal at the mouth or intake section was 950 feet wide and gradually narrowed to 200 feet. The wide mouth intake enabled water to be diverted at a velocity slow enough to avoid a cross current endangering passing ships. To prevent erosion of the intake section, retaining cribs were built from 12 Inch square timbers faced with planking and filled with stone. As most portions of the canal were sand or clay, a special timber lining was installed to protect the sides and bottom from erosion. While the superficial planking of the canal is continually eroding, the timber pilings driven into the canal bottom and sides continue to act as a strong, stabilizing influence on the canal structure. After the commitment was made to the carbide production, each penstock unit was set to produce 500 horsepower. In order to produce a maximum 40,000 horsepower, a minimum of 80 penstocks was necessary. A typical powerhouse at that time usually had from five to seven penstocks, but generated more electricity per penstock. While many power plants were using vertical shaft turbines, the horizontal style of the Sault plant provided an increase in power. No other hydroelectric plant in the world had that number of penstock units. To achieve the desired output, the powerhouse had to be a quarter of a mile long and today it still retains the honor of being the world's longest horizontal shaft turbine plant. The construction of the powerhouse foundation was very critical in powerhouse construction, this was often where the most mistakes were made. Test points on the shore of the St. Marys River indicated 15 feet of silt sitting on a foot or two of gravel which overlaid a bed of hard clay, 20 to 30 feet thick. Under the clay was bedrock. Eight test borings were made and because of uniformity of results, no additional tests were made. Von Schon erroneously determined that the entire area was the same. This error led to future structural problems which had to be corrected. The foundation was to be placed 16 1/2 feet below the surface of the St. Marys River, fully on clay. After coffer dams were built to keep the river water out, the silt and gravel over the clay was excavated and the site leveled. Next, more than 1,000 hardwood piles were driven 16 feet down and anchored across the top with concrete. Over this foundation, a system of tailraces, or enclosed tunnels, were built of concrete. The upstream walls were constructed of premolded concrete blocks. Penstock construction adopted by Von Schon contained several novel features. It was one of the earliest applications of skeletal steel construction for a hydraulic structure. Twelve-inch thick steel beams formed cells and were filled with poured concrete. For the dam at the forward end of the penstock, a semi-cylinder steel bulkhead was installed with 1/4" thick steel plates. This was a completely new design that was patented as a result of this construction. It eliminated a large amount of masonry and concrete that would have had to be substituted to hold back the water. The plan of construction in the rock sections involved channeling machines to block out sections of rock and drill crews with pneumatic drills to provide holes. Blasters then filled the holes with explosives and touched off the charges. Steam shovels or locomotive cranes then loaded rock into dump cars running along temporary tracks, and train engines hauled the cars to the dump area. In the earth sections of the canal, steam shovels did most of the excavation and loading onto dump cars. Work delays occurred during the severe winter months when very little could be accomplished. Additional difficulties arose from obtaining supplies and labor due to the Sault's distance from any major population or industrial centers. In 1899 employment agencies were trying to find 200 to 300 men immediately. In 1901 it was reported there were barely enough men to keep the excavation of the forebay area going. At that time they needed 400 to 500 men, many with experience in concrete work. Those recruited would receive free transportation to the Sault. But in many cases, even those who arrived did not stay long. Once work began, it involved eleven primary contractors and hundreds of various employees working simultaneously on the different aspects of the project, such as erecting walls, excavating rock and earth In the power canal, installing piles of timber lining in the earth section, excavating in the forebay, and constructing the embankment lining, in addition, the powerhouse substructure was begun and erection of a coffer dam around the compensating works site was in progress In the river. At the same time, work began on the substructure of the headgates. The contractors hired were to bring their own equipment with them. Many of the contractors did not bring enough equipment or underestimated the ability of their equipment to function under this situation and more delays occurred. Rain caused bank erosion several times throughout the project. A rain storm in 1899 filled the rock cut area to a depth of 16 feet, submerging two steam shovels and delaying work for ten days. Work on the powerhouse proceeded while the canal was being dug. Because the ground was so irregular with clay, silt, gravel, and muck the foundation had to be completely redesigned in 1899. Instead of just over a thousand hardwood piles, now more than '10,000 piles had to be driven down 20 to 30 feet. In addition Von Schon planned to drive six-inch thick steel pilings eight to sixteen feet down around the entire foundation. Electrical equipment In the Union Carbide portion of the powerhouse was selected in '1898, as Westinghouse had assumed that portion of the contract. Things were not as clear on the electric company side of the plant construction. Decisions were still being contemplated about how much horsepower and how much direct current and alternating current should be provided to the city for street cars, lighting, and other uses. It was anticipated at this time that power would be transmitted some distance from the plant and eventually even to the lower peninsula. Much equipment was shifting to alternating current at this time as it was safer and the bulk of the installation was designed to generate alternating current. In February 1902, the first set of electrical generating equipment for the utility company was put into place with more being added the following year. At the same time switchboard equipment which could be used to control power generation was being contemplated and redesigned. Again the scope of the switchboard operation would be unparalleled in the history of hydroelectric generation. New systems had to be originated to maintain consistent and uninterrupted power flow so that if there were a problem with one generator, the whole plant would not shut down. All control over the generators was by switches which had to be activated by manual means. Each generator had its own bus bar which acted mainly as a load equalizer. Also, solenoid circuits were Installed and immersed in oil. They would be held closed by current flowing through at normal levels, but would open automatically when overloaded or when no voltage flowed. The power transmitted outside the plant would be stepped up by transformers. As one portion of the operation after another was finally completed in the summer and fail of 1902, plans were made for testing the power canal and powerhouse and a formal opening of the plant. Using a temporary switchboard and a few operative units, electrical generation was provided for the grand opening. It would be three months later before all the electrical generation equipment was installed for the power company. On the carbide side of the plant, production operations began in December of 1903. Water was first let Into the canal in August of 1902, after The Rivers and Harbors Act of that year was negotiated between lake carriers, Congress, the U.S. Corps of Engineers, and Francis Clergue and Associates. The Corps of Engineers did not sign a permit to divert water until December 1902. Special arrangements dealing with the Sault Hydro plant operations were conducted by the Secretary of War, Russell Alger, a former Michigan Governor. This original contract set the basis for future dealings concerning the availability of water for power generation. The grand opening was set for October 25, 1902. Invitations were sent to all members of the Michigan State Legislature, the Governor, the heads of the state government departments, the U.S. Congressional delegation from Michigan, Minnesota, and Wisconsin and a large number of prominent American engineers, businessmen, and representatives of the press. Special trains were chartered at company expense, bringing Investors and potential Investors from New York, Philadelphia, Chicago, Detroit, Montreal, and Toronto for the celebration. The second floor of the powerhouse was used for the celebration, which was attended by 5,000 people. A large civic and military parade was held and Clergue's sister, Helen, threw a gold and jeweled switch, setting two generators into operation, lighting up several strings of arc and Incandescent lamps, and setting In motion a street car that ran over tracks laid from the powerhouse to the country club. Speeches were delivered at the banquet, with Clergue offering a rosy picture of Industrial development In Sault, Michigan. It was thought to be only a matter of time until this small outpost of the eastern upper peninsula would become a thriving city of over 100,000 and an industrial center of the Midwest. But even as the celebration was occurring. Clergue's Industrial empire In Canada was crumbling. The Consolidated Lake Superior Corporation was now worth $117 million, with an annual budget that at times exceeded that of the whole province of Ontario. With all the various companies -- the steel mill, the pulp mill, the hydroelectric plants, the steamship and railroad lines, and mining operation -- the area looked prosperous, but It needed continual Investment capital to keep it going. The financial crisis worsened as sources of capital dried up. Payrolls for some of the companies in Sault, Ontario could not be met causing the Directors to pressure Clergue to resign in April of '1903. The Ontario and Canadian governments stepped in to help regulate the industry and meet payroll. The companies were reorganized and sectioned off. Many continued to operate and still do today as the Algoma Steel Corporation, St. Mary's Paper, Algoma Ship Lines, and Algoma Railways. The Michigan Lake Superior Power Company was also in disarray and $7 million in debt. The problems MLSPC faced were numerous. The compensating works were insufficient to divert lake water and needed to be expanded. There were legal questions, such as ownership of the St. Marys Rapids. Problems also began to appear with washouts. Repairs needed to be made to existing generators to allow them to operate at full capacity. Union Carbide was leasing power at far too low a rate to make a profit. It became more questionable whether new industries would be coming to lease electric power, even if they could be found. By February of '1903, a washout under seven of the penstocks occurred. The total repair program took nearly seven months and cost $180,000. In October of'1903, the plant passed into receivership, along with the rest of Consolidated Lake Superior Corporation, in 1904 the main bond holder, Provident Loan and Trust Company, foreclosed and the Michigan Lake Superior Power Company was reorganized with two separate managers. For the next six years, forebay leaks were frequent, restricting operating flow. Receivership certificates were issued to pay for repairs. Meanwhile, at the turn of the century, the Edison Sault Electric Company continued to supply electricity to the city of Sault Ste. Marie, and William Chandler worked to enlarge the powerhouse in the rapids. Chandler filed a claim on the land between the ship canal and the rapids. In 1901 Chandler applied to the War Department for permission to expand Edison Sault's public works and intended to lay claim to all of the water flowing over the rapids. This was in direct conflict to the needs of the Michigan Lake Superior Power Company, who diverted adequate water into their canal. It was evident to Clergue that if Chandler could develop a greater capacity for power in the rapids, he could produce it at much less cost per horsepower than MLSPC. In 1902 the Rivers and Harbors Act specified that water could be diverted into the power canal for the hydroelectric plant, except that the provisions of such an action could not be held to affect any existing rights of persons or corporations. Ownership of the water power in the rapids remained in legal limbo during the MLSPC's first two years of operation, in 1905, the U.S. Circuit Court found in favor of Chandler and Dunbar. Because this would definitely affect the amount of water available for the M1.SPC plant, the ownership immediately appealed. In 1905 an international Waterway Commission was founded so that Canada could be represented in issues concerning water rights in border areas between the two countries. This Commission recommended that respective governments assume absolute control of all waters and lands necessary to improve or promote navigation in the international streams. Also in 1905 the Michigan legislature passed Public Act 264 granting franchise rights to utilities which would be serving specific areas. Edison Sault obtained a franchise at this time to save Sault Ste. Marie in perpetuity. The 1909 Rivers and Harbors Act authorized condemnation of all private lands in the rapids and instructed the Secretary of War to lease to private interests any water available In excess of the needs of navigation. This meant an end to Chandler's expansion of Edison Sault Electric in the rapids. The Edison Sault Electric Company was paid $300,000 for their plant property but was able to continue to service the city by purchasing the excess power not needed to operate the locks. The 1909 Act also required that Michigan Lake Superior Power Company enter into a lease agreement with the government for use of the water. This original lease became the contractual foundation which today is still in effect with the Corps of Engineers and enumerates the rights to the diverted river waters for hydro generation. In 1910, because of extraordinarily low water levels In Lake Superior, the Corps of Engineers ordered that no water could be diverted to the power canal during the months of April and May, repairs to the forebay area were made. Once this was completed, no other major leaks occurred for several years. In 1910 Union Carbide offered to buy out the first mortgage bond holders of the MLSPC and assume ownership of the power plant. Seeing an opportunity to rid themselves of the plant and its inherent problems, the bondholders worked out a complex agreement and sold control in 1913. The new electric company, called the Michigan Northern Power Company, filed Articles of incorporation with the Chippewa County Clerk in August 1913. The property was turned over to the Michigan Northern Power Company and backed by the assets of the Union Carbide Corporation. An expansion quickly followed with contracts to Westinghouse for deilvery of new electrical generation equipment. By 1917, all 80 penstocks were in use and turbine installation was complete. Penstocks 1, 43, and 81 did not hold electrical generation equipment, but were open as emergency spillways. The plant was now running at a designed capacity with 40,000 horsepower. The conditions of the lease required that Union Carbide pay for the per second cubic foot amount of water used and that there would be built compensating and remedial works necessary for water diversion. The company also pledged to repair and strengthen the powerhouse and forebay. Four compensating gates already existed which had been built by Lake Superior Power. The Canadian government agreed to construct four on their side and Union Carbide's new power company, Michigan Northern, agreed to construct eight more, making a total of 16 gates to regulate lake flow. Work began In September 1914 and was completed in July of 1916. Coffer dams were built, towed into place, and sunk around the location. Water was pumped out and work on the substructure was started. Upon completion, a dyke was added and enlarged, completely enclosing the rapids area by 1922. These units are still in operation today and efficiently perform their functions of regulating water discharge from Lake Superior. In 1915 Union Carbide determined that they wanted to remedy the problems with water deflection and leaking through the powerhouse. This water In the forebay was drained and a reinforcing concrete apron with steel rods connecting sheet piling to the forebay wall of the power house foundation was installed. Cast Iron pilings were also driven at a 45-degree angle through the tailrace floors. Six of these in each of 80 penstocks were filled with concrete. The final addition was made In the form of cast Iron buttresses, six feet In diameter, filled with concrete, and placed in every other tailrace wall, connected with an arched bridge the full length of the river side of the powerhouse. By 1917 this reinforcement would prevent the powerhouse from sliding, and fears of structural failure were gone. This was the last major action which had to be taken in order to stabilize the hydro plant. Meanwhile, the economic conditions of the Sault began to improve. During World War I there was an increased demand for calcium carbide, and the plant in the Sault went on to become the largest single producer of calcium carbide in America. Other industries were attracted to the Sault, but not for the hydro-power. In 1890 the Soo Woolen Mills were founded because of sheep farms in the area. In 1900 Northwestern Leather located on the upper river, just west of town. This company, called the "Tannery", became the area's biggest employer with a payroll of 850 during the war years. In 1914 Edison Sault established the Chippewa Edison Company to serve the areas outside of Sault Ste. Marie. Chippewa Edison eventually went on to build distribution systems in Rudyard, Cedarville, Hessel, and Dafter, and in 1932, was absorbed into Edison Sault Electric Company. In the 1920's Sault Ste. Marie had twelve factories, was served by 15 passenger steamship lines and four rail lines, and had a population of 14,000. During the depression of the early 1930's, the Sault's diverse economy remained fairly stable because of continued contracts at the Soo Woolen Mills, Northwest Leather Company, and Union Carbide. In 1929 a company called American States Utilities, a large holding company owned by Samuel Insull and based in Baltimore, Maryland, bought all the outstanding stock in Edison Sault. They went on to purchase water and electric utilities on Mackinac lsland and St. lgnace, with transmission lines to the pulp and paper mill in Manistique. During 1931 Edison Sault began providing power to the Manistique area, both to the city and to Manistique Pulp and Paper, an arrangement still in effect today. In 1935 Edison Sault purchased the Northern Industrial Power Company, a subsidiary of Michigan Northern, that had been supplying industrial customers such as Cadillac Soo Lumber within the city limits of Sault Ste. Marie. In 1936 the Upper Peninsula Power Company and St. Ignace Public Service merged with Edison Sault to service a total of 6,500 customers. In 1941 Edison Sault purchased a used steam plant from Consumers Power for $334,000. The steam plant was dismantled In Flint and transported in sections and reassembled In the Sault. The U.S. government was In the process of constructing a new plant in the rapids to provide power to both the locks complex and the local area. The steam plant was subsequently abandoned in 1957. In 1944 Fort Brady dosed and the facility became the Sault Ste. Marie branch of Michigan Technological University two years later. It went on to become Lake Superior State College In 1970 and Lake Superior State University In 1982. After World War II because of changes In the law restricting holding companies from owning all outstanding stock In utilities, the Securities and Exchange Commission ordered American States Utilities to liquidate Its holdings of Edison Sault Electric Company stock. The suit took place in the Omaha Division of United States District Court In 1947. It was at this time that Harold "Duke" Polian and other Investors from the Omaha area became actively involved as owners and directors of Edison Sault common stock. 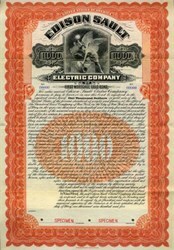 This time period marks the availability of Edison Sault common stock to be sold to shareholders, and 1947 is regarded as the modem beginnings of Edison Sault. The capitalization of the Company at that time was $941,000, with 188,324 shares of common stock outstanding. In 1951 the new U.S. Government Hydro plant went on line next to the rapids north of the locks. Edison Sault then entered into a lease agreement to purchase that plant's excess power, an agreement which is still in effect today. A change In the U.S. economy after the Korean War In the 1950's impacted a number of businesses In Sault Ste. Marie. The major Industries of Northwestern Leather, Cadillac Soo Lumber Company, Soo Woolen Mills, Lock City Marine and Machine, and Our Own Bakeries all went out of business in the Sault and Union Carbide cut back on their employment. The Sault's Industrial decline continued when chemical advancements produced substitutes for acetylene and custom carbide products. The Union Carbide closed its plant in August of 1963 and officially ceased operations In November of 1963. At that point they sold the canal and power generating plant to the Edison Sault Electric Company for $1,500,000. Edison Sault then made necessary electrical conversions to 60-cycle power, and production of electricity and transmission began in 1964. Even though industry was leaving Sault Ste. Marie and the population was declining, the market for electrical sales continued to expand. Edison Sault Electric and Consumers Power, In northern Michigan's lower peninsula, agreed to interconnect and in the summer of 1956 cables were laid across the Straits of Mackinac, connecting Consumers Power with Edison Sault. This accomplished two needs. Edison was guaranteed power for the future, and Consumers would receive excess power generated from Edison Sault at night and during the low usage periods. In 1960, 610 military personnel at the Sault's Camp Lucas Army garrison were transferred out. Meanwhile, Kinross Air Force Base was growing, 18 miles south. Eventually named after the test pilot, Ivan C. Kincheloe, the Strategic Air Force Base closed in 1977. Today the base conversion has resulted in a community of 3,000, with industries accounting for 1,500 jobs. Two major construction efforts impacted the Sault area during this time. In 1957 the Mackinac Bridge was built and the construction of 1-75 was directed toward Sault Ste. Marie. In 1962, the International Bridge was constructed jointly by the U.S. and Canada. From the early 1960's through the 1980's, Edison Sault's service area grew in response to demands placed by the increase in businesses related primarily to tourism. Also, several large industrial customers have settled into the service area and enjoy the low-cost energy provided to them. As the demand for electricity has continued to increase, Edison Sault has been able to accurately predict the best course of action to take in response to increased customer service requirements. In 1975 Edison Sault laid a second submarine cable at the Straits of Mackinac. In 1981 joint transmission and substation projects were concluded with Cloverland Electric Cooperative which buys power from Edison Sault to distribute to the rural communities of the eastern upper peninsula. In 1982 additional submarine cables were laid to Mackinac Island and substantial upgrading of facilities has since occurred on the island. The following year Great Lakes Power of Canada completed their new hydroelectric plant in Sault, Ontario. Prior to this, Edison Sault Electric used as much water available for generation as it could. Upon the construction of the Canadian plant, Great Lakes Power exercised its legal claim to one-half of the water for its own production purposes. In 1977 concerns for the environment led Edison Sault Electric to work with the Biology Department at Lake Superior State University to set up a fish research facility in the hydroelectric plant. An ideal condition existed to use flowing lake water to raise freshwater fish. Species are either raised from the egg stage or received from the Michigan Department of Natural Resources and reared in fish tanks for releasing Into the St. Marys River. In 1985 Great Lakes Power joined with Edison Sault in establishing a protected area in the rapids for fish to spawn near Whitefish Island. To accomplish this, a berm or wall, 2,000 feet in length, was completed in the fail of 1985. Construction of this berm allowed more water for power generation and saves our customers in excess of $1.5 million dollars annually. In 1989 Edison Sault was also able to acquire 2,000 new customers in the Garden Peninsula from Wisconsin Electric Power Company. This acquisition meant an increase in miles of service lines running to the western part of Edison Sault's system. Growth and development continue to occur in the Company's service area. The Sault Ste. Marie Tribe of Chippewa Indians has gone from establishing a federally recognized reservation in 1974 to becoming the city's largest employer through their tourist and gaming enterprises and service programs. Major shopping centers are in the process of being constructed at the interstate 75 junction south of Sault Ste. Marie. A downtown marina project is moving forward at the local and state levels. Building has also taken place in St. Ignace and on Mackinac Island. To the west, industrial customers such as Manistique Papers, Pfizer Specialty Mineral and Lakehead Pipe line continue to place demands on electric service. In 1987, Edison Sault Electric began a review process to determine what was needed to keep the hydro plant operating into the new century. The study determined that much work was needed to upgrade and replace the aged equipment and electrical wiring. Studies were also made to see if the plant could be made more efficient and productive through the use of modem automatic controls. The modernization project was conceived in the fall of 1987 and broken down into five phases. The first four phases, which began in 1988, involved the Installation of automatic controls on each electrical buss and the generators. The final phase is the Implementation of a computer which will provide maximum plant efficiency. The modernization project, when fully completed in 1993 will cost in excess of $7 million dollars. As part of the plant modernization, studies were also completed to rate the generating efficiencies of each individual turbine unit. Due to various physical forces, some units are more efficient than others. The final phase of the project, M.E.D. or Most Economic Dispatch, completed in 1993, uses computer information gathered from each unit in order to improve the total plant efficiency. The central plant computer allows the system controller access to each generator unit from the control room. This executive interface allows Information to be directly monitored through a computer terminal. In 1987, when the modernization of the hydro plant was in the planning stages, Edison Sault developed three objectives which it hoped to accomplish in this project. A review of those objectives, which will be restated here, shows that they have been accomplished. "Because the Company has secured the rights to the water used for generation until at least the year 2025, the first objective is to upgrade the reliability of the plant to last at least that long Studies have shown that the structural Integrity of the plant is most sound and should last Indefinitely"
The second objective is to provide rate stability for the customers of Edison Sault. The Company feels very strongly that the low rate structure enjoyed by its customers should be solidified by ensuring that the plant which provides those low rates continues as a reliable and efficient operation. The third objective is to implement the plant modernization without employee layoffs. Although the project will mean that nine full-time positions will be eliminated the Company thinks that layoffs may be averted through the repositioning of affected employees within the Company and by normal employee attrition through retirement."